The Samsung Galaxy Note 9 is about to be unveiled on the 9th of August and — of course — there are plenty of rumors and leaks to go around. It can be argued that, by now, we have a pretty good idea of how the Note 9 is going to look. Numerous sources have claimed the same thing — it will look very similar to the Note 8, though, the fingerprint scanner on the back will be placed in a more central position. The camera module itself will remain horizontal, unlike the one on the Galaxy S9, since the manufacturer reportedly wanted to fit a 4,000 mAh battery in the new S Pen-equipped phablet. 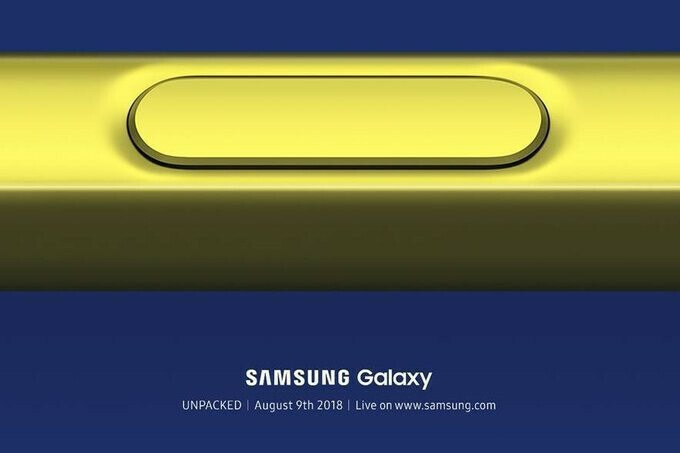 Samsung's invitation for the August Unpacked event featured a closeup of what appears to be a yellow or golden S Pen. At first, this led to speculations that there might be a very vibrant yellow variant of the Note 9 at launch. However, soon after, we got a number of leaks referring to all the colors the handset would launch in and there was no yellow. So, what gives? 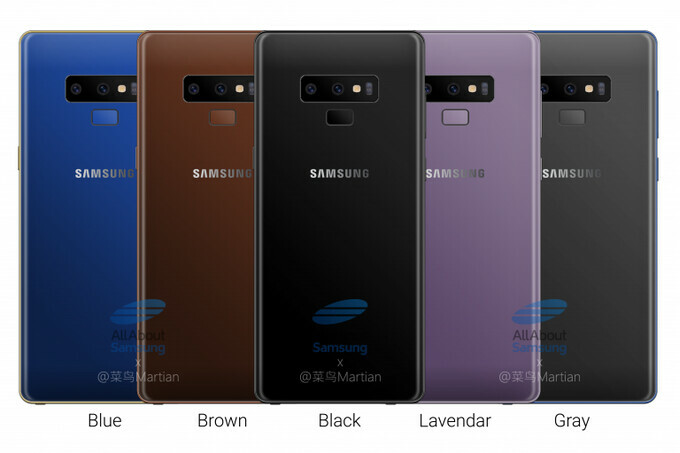 Well, according to some leaksters, the Note 9 might have a duo-tone thing going on where the S Pen would come in a color different than the one the phablet is dressed in. Take this bit of info with a grain of salt, as one naturally should, but it's worth noting that this latest leak we have here reaffirms this information. Posted up by leakster Ice Universe, we have what is allegedly a promotional poster of the upcoming Samsung Galaxy Note 9. It features the phablet in blue and very clearly shows the yellow S Pen laid on top of it. The back side of the phone is entirely visible, so we can see the reaffirmation of previous leaks that the dual camera and the heart rate sensor are all placed in a horizontal layout, while the fingerprint scanner lays right below them, in a more central position. The skewed and awkward placement of the fingerprint pad was one of the major critiques the Galaxy S8 and Galaxy Note 8 received, so Samsung made sure to fix it with this year's revamp of the top-tier devices. It's also worth noting that this S Pen doesn't look the same, aesthetically, as the S Pen on the leaked Galaxy Tab S4 render, which we saw yesterday. Both products seem to be headed in different directions in terms of ergonomics, but we have no reason to believe they will differ functionally, at least not yet. 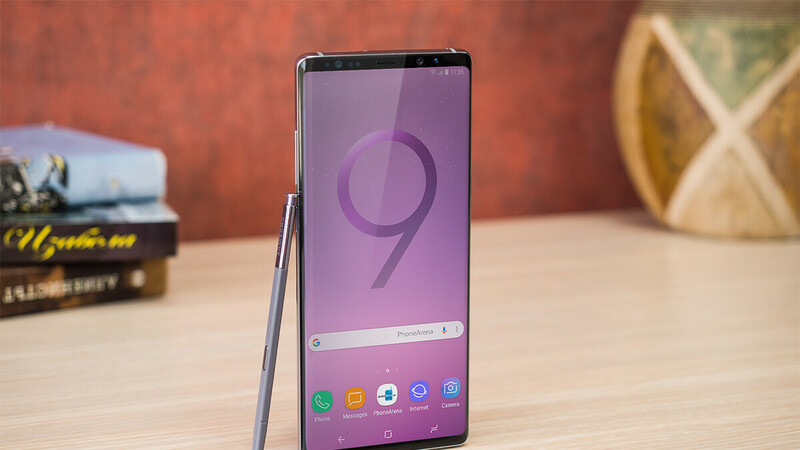 The Galaxy Note 9 will, supposedly, launch on the 24th of August with what is said to be a significantly upgraded S Pen and we can't say we aren't already itching to try it out! 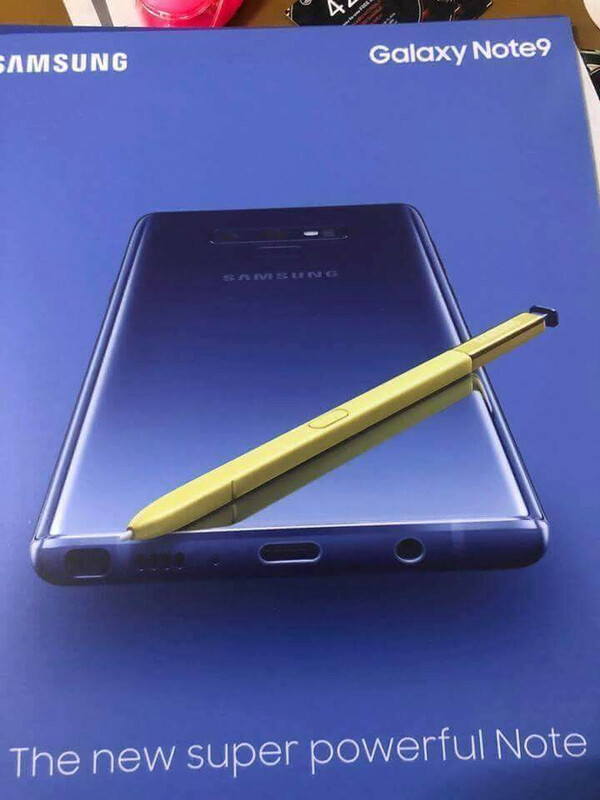 Blue phone with yellow pen? Uh... what a weird combination. Yellow is a complementary color to deep blue.... color theory lesson 101. Am I the only one thinks the 4,000 battery means 90fhz screen like the ROG phone from Asus? what does battery size have to do with screen refresh rate? Guys. If 4000 is true it will be a first for Samsung. Think a little, S7 s8 compared to note 7 and 8 batteries, the notes were even smaller. With note 9 it's going to be a huge jump from s9 plus 3500. and from note 8 3300. Which means there something extra to the hardware itself needs all this power. And I am sure it will have the same camera same CPU as s9 plus except the screen a little bigger and might include a new tech. Got it ? Nice that they're keeping the jack and added a 4000 mAh battery. Looks like a real power house. what a samsung obsession to keep finger print scanner close to the camera ! Note9 looks good. Will buy. If not, then get a deeply discounted new Note8. It's all good, a win-win situation! New s-pen features and battery capacity have me very intrigued about the Note 9... Can't wait to get my hands on it! I doubt battery is 4000... Difference between S+ and Note is almost nothing when it comes to size... Note loses more space because of pen. Try thinking, where the pen is stored? I've course they can. The phone will be heavier at 230G. I'd take a 4500Mah at 250+ Gramms. Oh no. Now I'm tempted to upgrade from my S9 plus. That was true. Nothing wrong having the same design for 5 years. You don't see car makers changing design every 1-3 years even watch makers don't change design after 6 years. So let it be. Someone coming from note 5 is going to get a great update to the note 9. If coming from note 8 less of a update but still some new stuff. Not a huge fan of the design. But I wasn't really a fan of the Note 8. Looks like a reference device, and not a final design.